Billingham Street is a small stabling point near Billingham in the North East of England. It services the collieries in the area. 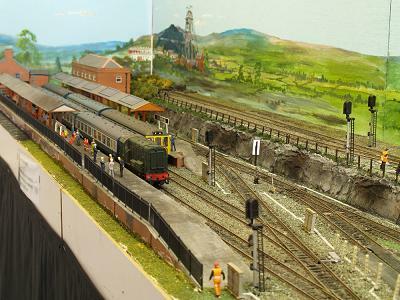 The layout was built to show how much you can have in O gauge in a small space. 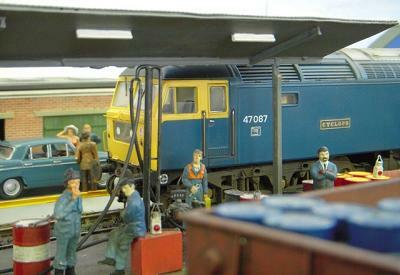 The period depicted is the mid 1970's, blue livery. Locomotives featured include class 03, 08, 20, 31, 47 and 55. 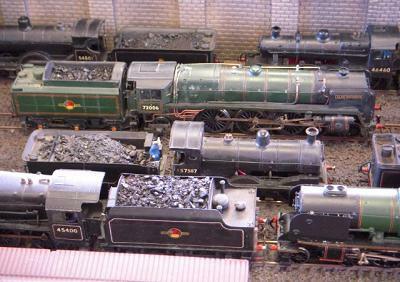 The stock is Heljan, Bachmann and DJH, mostly ready-to-run and some kit-built. The road vehicles are a mixture of Vanguards and Corgi. Cwmderi is at the head of a valley on the north-west ridge of the South Wales coalfield. It is the town in which the BBC Wales soap Pobol-y-Gwm is set. Since the closure of the Pwll-y-Dderwen colliery - where the 'mid-level' lines once ran - the tourist industry for the visitor and the outward-bound centre at Y Plas generate sufficient traffic to warrant through services from the Swansea to Fishguard main line, as well as the local services. Cwrtmynach Quarry provides a high volume of traffic through its reception sidings (high level) as well as receiving supplies by rail because of its remote location. 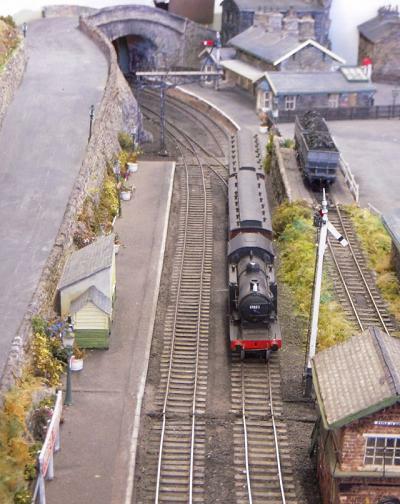 The old steam shed has been replaced by a diesel stabling and fuelling point. The trackwork is as it was when it was re-aligned not long after the end of steam services. The layout is normaly operated in the 'BR Blue' era, just after the introduction of TOPS but some pre-TOPS numbers are still in evidence. The signalling has recently been modernised as part of an area scheme and full multiple-aspect colour light signalling is in evidence. 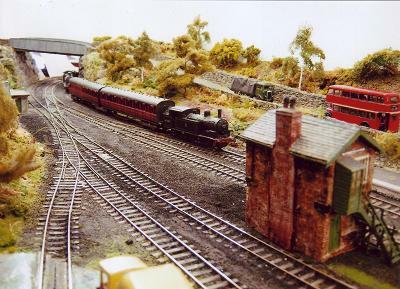 The layout is based on nowhere in particular although it is intended to be typical of the confined places that the railway builders were forced into by the lack of ground space in some South Wales valleys. Trackwork is all Peco code 75, with all buildings being scratch-built from Plasticard. 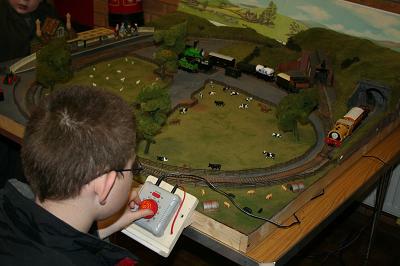 Train operation is by Lenz DCC but pointwork and signalling is controlled by a traditional switch arrangement. All stock is fitted with Kadee couplings for hands-free shunting operations with some of the wagons and coaches working as fixed rakes. Elm Park is a fictitious areas of south-east London served by a spur off the old L&SER mainline from Victoria. The station was originally on a through line which reduced to single track as it passed through a short tunnel, but was cut back after World War II and is now operated as a terminus with run-round facilities. 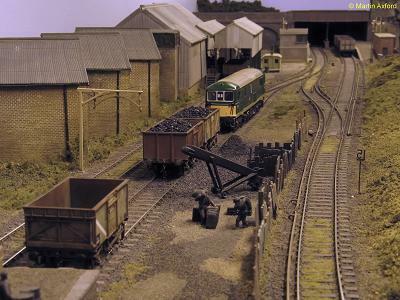 A small general freight yard and a lino factory remain in use and are rail served. Passenger services are operated by 2 or 3 car electric trains. Freight services are mainly trip workings handled by Class 33 locomotives, although the occasional Class 73 sometimes can make an appearance. 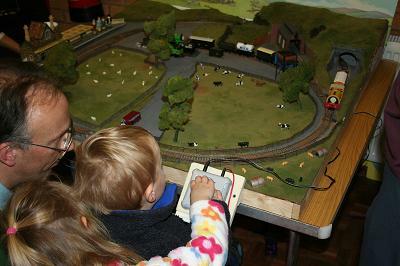 The layout is 12 feet by 2 feet, the track being hand-built using C&L components. 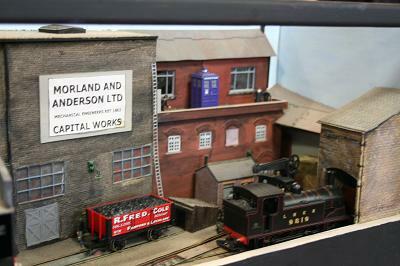 Buildings are mainly scratch-built using plastic moulded sheets on hardboard backing. 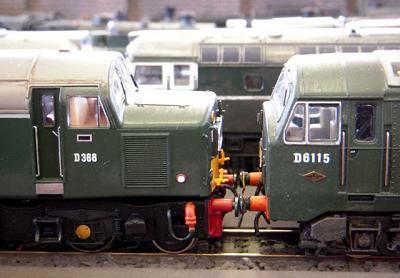 The period modelled is the late 1960s, which allows us to run both green and blue diesels. It is the 1980s and summer. The yard at Frampton serves the nearby inland waterways dock at Sharpness and is connected via a spur to the nearby Sharpness branch. The decline in rail traffic to the docks has contributed to the deterioration of the yard at Frampton, however its location is key to its survival. Frampton provides a useful rail connection to the nearby surviving industries and more recently the district civil engineer has started to utilise the yard's proximity to the nearby Bristol to Gloucester main line. 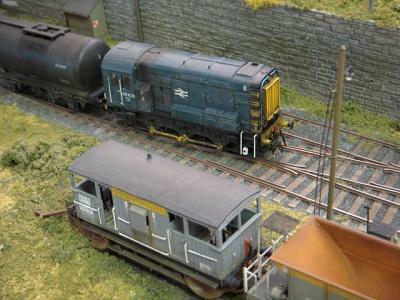 With frequent visits from mainline locomotives, yard space soon becomes scarce as the resident class 08 shunter jostles wagons for space. Frampton is a fictional location. The layout was originally conceived for the Scalefour Society 18.83 Challenge and has been built in accordance to the competition rules. Its design permits easy storage and transporation, with the layout easily fitting in a small family car. 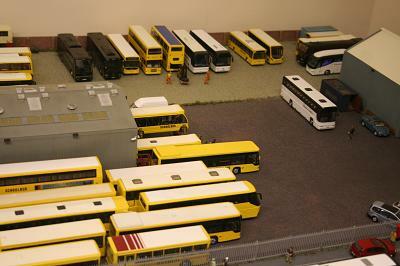 Although the overall dimensions of the layout are small, it demonstrates that an intensive operational layout can be achieved in a small space. Operation is by 12V DC. 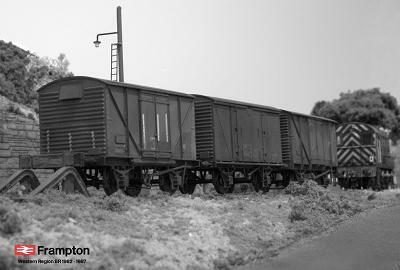 Wagons and locomotives consist mainly of detailed and converted ready-to-run and kit-built stock, running on hand-built trackwork, mainly constructed using copperclad and 'ply and pins' method. Just off the south coast of England is Hayling Island. At the end of the ninetenth century a railway had been constructed for the use of goods and the local community. After the Second World War, it became a well-visited holiday resort during the summer months by both holidaymakers and day-trippers. A very intense regular passenger service was operated to cater for the visitors to the island. The Terrier class of locomotive, which was designed by William Stroudley, was not the only type of locomotive to use this line. In the early days, there was a very wide range of small steam locomotives used. However, by the turn of the century the Terriers were the main source of motive power. The wooden trestle bridge was the eventual reason for the closure of this line, the elements from the sea taking their toll on the structure. For ths reason, the Terriers, due to their light-weight, lasted until closure of the line in 1963. One of the Terriers that were used on the line ended up as a public house sign on the island. It has has since been returned to traffic on the Isle of Wight Steam Railway. This was my first laout designed for exhibition use and a Iwanted to have a go at building almost everything from scratch. The track, buildings and some rolling stock are mostly hand-built, either from kits of adaptation of kits. Llanfairish as originally conceived was merely a test track for my OO9 stock. However, since then it has developed a life of its own. 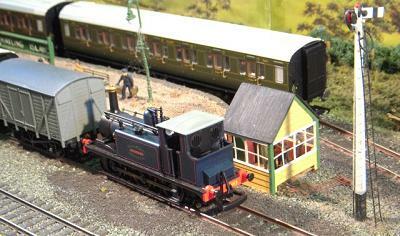 It is based on Llanfair Caereinion on the 2 foot 6 inch gauge Welshpool & Llanfair Railway in mid Wales. 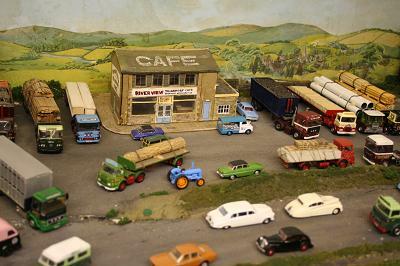 It is modelled as it was in the goods only era of the 1940s and 50s. Moreton New Shed shows part of a motive power depot (MPD) in the British Railways steam era between the years of 1950-68. 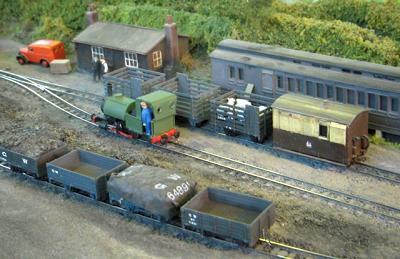 It features a large number of kit-built and detailed ready-to-run locomotives. 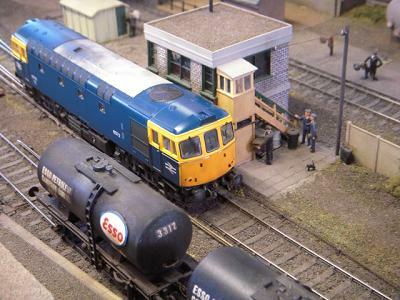 The scene depicts some quite new locomotive servicing facilities built as an addition to a larger MPD, including facilities for diesel locomotives. Moreton is operated featuring engines from different areas of the country, particularly Scotland. The layout is exhibited to reflect a different regional emphasis that may change several times during the course of an exhibition. 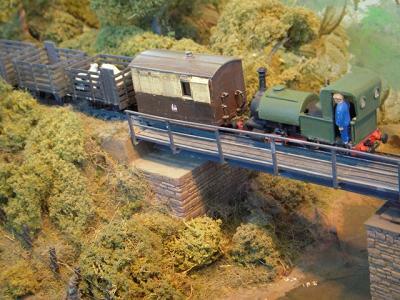 The layout replaces the former 'Moreton Loco' which appeared at exhibitions a few years ago and was sadly ruined by flood water after storms in 2007. 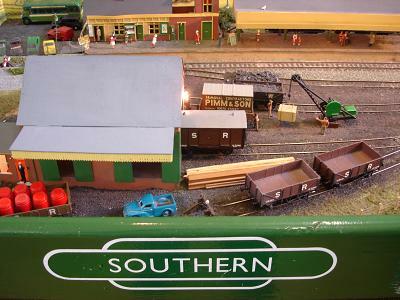 Some of the scenic items salvaged from that layout are to be seen on this new locomotive shed scene. 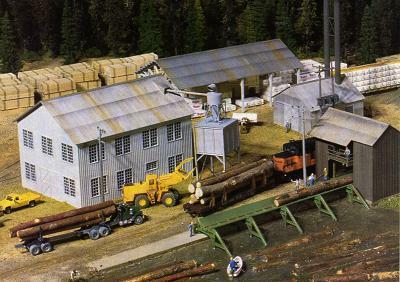 This N gauge layout depicts a typical scene of a sawmill and lumber yard that can be seen anywhere across the United States and Canada today. Lumber is brought to the sawmills by road and rail, the logs would be held in lakes, rivers, ponds and log pools prior to cutting. The logs have to be debarked before they can be cut in the sawmills and the waste wood chippings go to mills that make cardboard and paper. The sawdust is piped to the sawdust burner. When the timber has been cut, it is then put into stick to either kiln dried or air dried. In the past, Climax, Heislers and Shay steam locomotives were used to haul the heavy loads to the sawmills, but today it is mostly diesels. 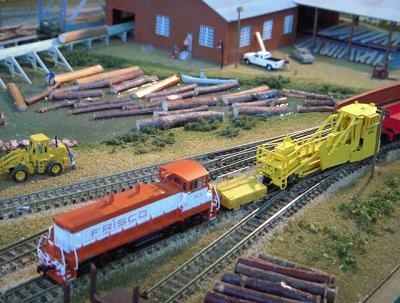 The logs are put on skeleton logs cars, bulk heads and gondolas cars. The beautiful valley of the River Wharfe marks the northern boundary of the industrial region formerly known as the West Riding of Yorkshire. The railway that was eventually built through the dale was a joint venture between the North Eastern Railway and the Midland Railway, linking the Leeds to Carlisle route with the Leeds to Tyneside line but bypassing Leeds itself. Rail traffic reflected this background with local trains linking Leeds and Harrogate with towns in the valley. 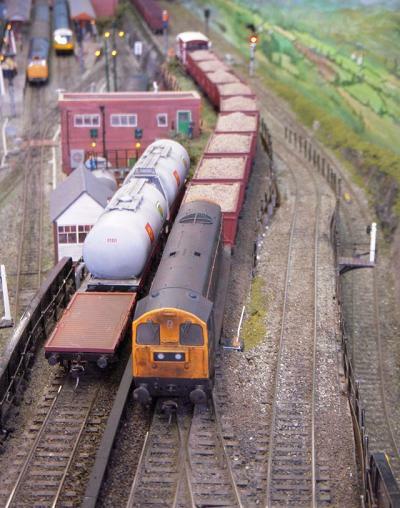 Through freight services include the ICI anhydrous ammonia tank train, as well as other fitted and mixed goods traffic. Excursion trains to the coast can also be seen. The period chosen is the early fifties. 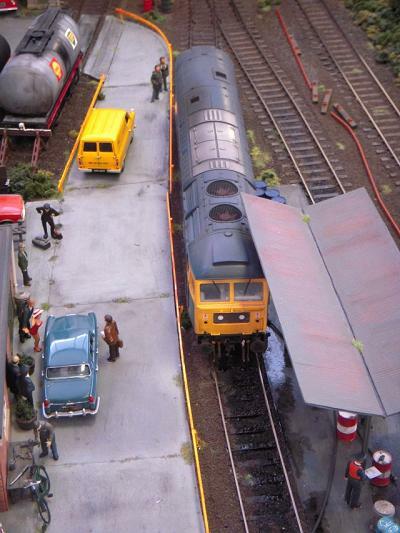 A Derby lightweight twin car DMU is included. They first appeared in the West Riding at that time and were very popular. Sadly, however, they could not compete with the local bus services. 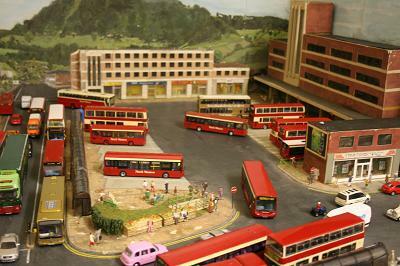 In recognition of this, there are buses and lorries moving along the road at the back of the model at realistic speeds. In order to make some minor track alterations to the actual location, the name has been amended from Pool to Poole. The buildings, etc are, however, reproductions of those seen at Pool.